The world's window onto Shimizu S-Pulse: New Kit for 2013 Revealed! New Kit for 2013 Revealed! As previously tweeted, our new kit has been unveiled. Click here for the full information and graphics, or here for the promo picture. It signals a departure from the classic all orange kits we've sported until now, with black shorts and a black arm. The breaking up of the orange gives it a more serious edge if you ask me, and I'm a fan. The world map design is retained, which is of course a good thing. My girlfriend, rather bizarrely, commented that the home shirt reminded her of a dog(!!!). Not really sure what she was getting at there. Maybe the biggest change is that the away kit is now a striking shade of azure. For twenty years, there was an apparent consensus amongst all J1 teams that away kits must be white. This is wrong on so many levels, and I'm glad we've bucked that trend. None of that wishy, washy sky coloured cyan malarkey you understand. It's a strong, solid shade of blue. Looks pretty smart too. If you fancy one you better dig out the old piggy bank. 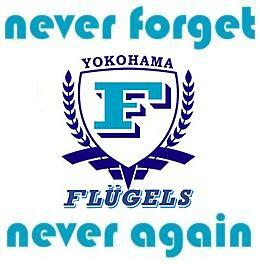 With a name and a number you'll be set back over 17000 yen. That's a cool £133 sterling. With most Premier League shirts going for under fifty notes, it's really hard to see how they can justify it, but if people will spend it... 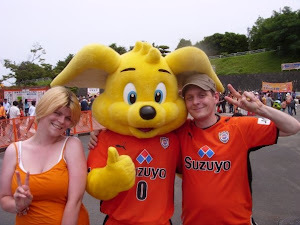 Think I'll put my 17000 yen towards an away day to Kyoto next season. I'd like to see the club getting its own number font, as it was the case before 2007. For exemple, Iw*** never had to sport Puma's generic numbers. Fair play if that's a collection you have to keep going! I bought the 2008 one with the weird mesh type material. It's not held up very well and has gone bobbly in parts. Not very good value for the 13000 I spent on it. I wore the 2008 shirt a lot of times, it doesn't have any problem fortunately. The 2010 model is way worst, the cut is not very good, it looks like a square, the material is very shiny and fragile, and I feel that the sponsors might fall off if I wash it some more. I think it's my least favorite. Cool! A picture of all the shirts lined up would be brilliant. Especially with yourself in the shot. 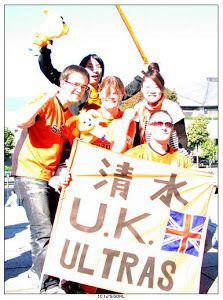 Our readers would be so happy to see an S-Pulse fan overseas with such passion for the team. A picture is a must!! As for my 2008 shirt, the sponsor is OK, but the pumas on the shoulders are peeling off. It's not like I even wore it that much. Poor value for (a lot of) money. Cup Final Special! 2008 :( 2010 :( 2012?